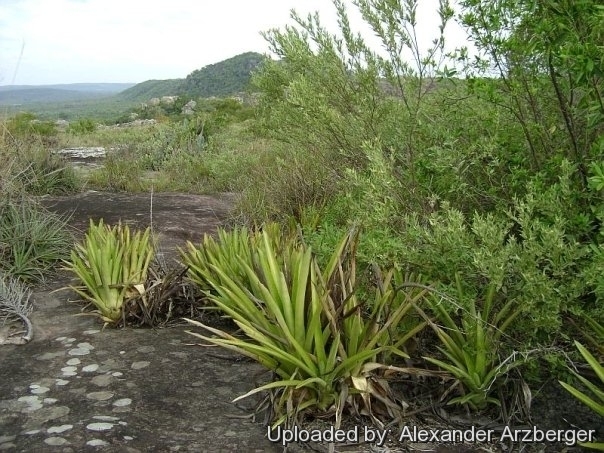 Origin and Habitat: Aechmea distichantha is a native of Brazil, Paraguay, Uruguay & Argentina.. Here occasionally also cultivated. Altitude range: 740- 2,400 metres above sea level. Habitat and ecology: This species is an epiphytic, lithophytic or terrestrial herb widely distributed in the understory of Cerrado woodlands (Brazilian savannah) often on patches of the palms Scheelea phalerata and Bactris glaucescens tougher with other ground-cover vegetation such as Bauhinia pentandra, Bromelia serra, Bromelia balansae, and cacti such as: the firecracker cactus or scarlet bugler (Cleistocactus baumanii) and Cereus peruvianus, just to cite some of the more common. It can tolerate harsh conditions. This bromeliad is also common in the Atlantic Rain Forest and is considered a generalist or pioneer epiphyte. “Plants show different morphologies when growing in different habitats, but they also vary in their morphology with plant size... ...Understorey plants are taller and had larger diameters, whereas sun plants had more leaves, larger sheath area, sheath biomass and sheath mass fraction.” . Flowers are pollinated the most by the hummingbird Stephanoxis lalandi and the most common butterfly visitor is Lychnuchoides ozias ozias. Description: Aechmea distichantha is an evergreen, basal-rosetted, terrestrial or rhizomatous bromeliad (Plant diameter 140-280 cm and height 50-100 cm). It produces dense, erect rosettes of narrow, straplike, round-lipped, arching leaves that can reach 1 m long. The small violet-blue flowers are arranged in distichous (distinctly two-ranked) floral spikes which lasts up to a month. The white-felted, pink floral bracts are attached to the stalk by most of their margins, forming characteristic cups. They are very striking in full bloom. Leaves: 30-100 cm, forming a very dense rosette, dull green above, grey and covered with a membrane of fused scales beneath. Sheaths usually much wider than the blades, toothed toward the apex, entire elsewhere; blades 2.5-8 cm wide, rounded and short-tipped. margins with stout spines 3-5 mm long. Inflorescences : The flower stalk (scape) is slender (about 25-45 cm long) white-woolly. The inflorescence is a spike composed of a cluster of showy bracts. The inflorescence is always bipinnate, dense or loose, ovoid to cylindrical, 10-22 cm long 7-10 cm diameter, pink and white-woolly, except for the petals and lasts about a months. The spikes erect to spreading, the laterals with 2-12 stalk-less flowers in 2 ranks, the terminal with more and many-ranked flowers. The floral bracts are entire, connected to the stem by their margins for most of their length, forming a cup. The number of flowers per inflorescence varies from 70 to 330, with 5-10 open flowers inflorescence-1 at any given moment. Flowers: Tubular. Sepals 5-13 mm. free or shortly united, asymmetric. Petals purple or blue. “Aechmea distichantha is self-compatible with 30-45% fruit formation in self-pollination tests” . Phenology: Blooming season (in habitat) from June to September and fruiting from June to October. Flower anthesis lasts only one day. Fruits: 60-310 x inflorescence, ripening approximately 40 days after flowering. Each fruit sets about 120 seeds. This production results in an average of 15,000 seeds inflorescence! Aechmea distichantha Lem. : (var. distichantha). Distribution: Brazil, Argentina, Paraguay, Uruguay. Aechmea distichantha var. glaziovii (Baker) L.B.Sm. : Distribution: southeastern Brazil. Aechmea distichantha var. schlumbergeri E.Morren ex Mez: Distribution: Bolivia, Brazil, Argentina, Paraguay. Aechmea distichantha var. vernicosa E.Pereira: Distribution: Rio de Janeiro State. 7) Borgo, M. & Silva, S.M. 2003. “Epífitos vasculares em fragmentos de Floresta Ombrófila Mista, Curitiba, Paraná, Brasil.” Revista Brasileira de Botânica 26(3): 391-401. Identification Center. Disponível em: <http://fcbs.org/articles/Aechmea_spp_table.pdf>. Cultivation and Propagation: Aechmea distichantha is a sometime cultivated due to the beauty of the foliage and of the inflorescence and the facility of cultivation. It a good ground cover in xeric gardens. This species will grows on rocks or on top of the ground but it will grow faster if rooted in well drained soil. Growing substrate: It requires a well-drained, aerated, gritty, humus rich, neutral to acidic, and moisture-retentive substratum (e.g. 2 parts peat moss to 1 part loam to 1 part sand or perlite). Watering: In summer it enjoys constant moderate waterings from rain or sprinkler, but allow the plant to dry in-between waterings, and reduced in winter. However it is quite drought-tolerant. Requires complete and perfect drainage as root rot can be a problem if the soil is too moist. Pest & diseases: It is susceptible to scale, trips and mosquitos that will sometimes breed in the pools of water that are trapped between the leaves. Mealybugs infestations and fungal leaf spots are also a frequent problem. Pruning: Remove old leaves from plant base and dead flower spikes only. Remove older plant crown when it begins to fade. Ornamental uses: Mass planting; container or above-ground planter; border or ground cover; suitable for growing indoors. Propagation: Remove and replant offshoots from around the parent plant in late spring or early summer. Sow seed at 27ºC as soon as ripe.